Does Bluehost work in China? What you must NOT do to optimize your website. What to do if your website gets blocked? 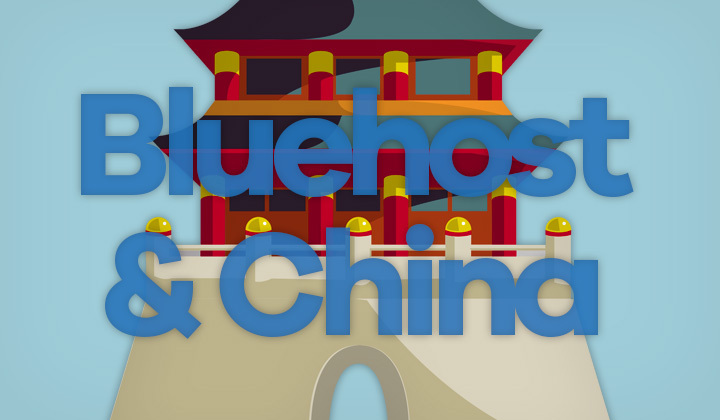 Not only Bluehost works in China, it also operates in China at Bluehost.cn which means that they have the much needed expertise to serve mainland Chinese customers, and provide access to good hosting to the area. Hosting there is a complicated issue, so which plan should you go for? No matter what the hosting plan, location is key and how well it’s connected to China. So although Bluehost’s Chinese website offers hosting in Hong Kong, this will in turn be slower for users outside of the country. While there may be no perfect, inexpensive solution for fast hosting on both continents and globally. Usually the best option is the West-coast in the US (here). But even amongst hosting companies with datacenters, you’ll need one like Bluehost that reserves China dedicated bandwidth for good accessibility. Bluehost provides a CDN (Content Delivery Network) service which serves your website from multiple servers around the world for optimal global speeds. It’s called SiteLock which includes the CDN, I do not recommend using this when hosting for Chinese website visitors. The first thing to consider is that their server in Hong Kong is not optimized for mainland China. So speeds will vary. First of all, Bluehost provides free “SSL certificates” for all of your hosted websites. Which is an absolute essential in 2019, because it gives you a boost in SEO and search engine rankings, plus increases trust. Sites using SSL have the HTTPS in front of the site URL. Otherwise the address will be HTTP and web browsers will warn that the website is no secure enough. And it’s really important to understand that if you enable the SiteLock service with Bluehost that provides the CDN, the free SSL will not work. To actually use them together will cost so much, that it’s absolutely pointless as there are much cheaper solutions for SSL enabled CDN access anyway. Because Bluehost is accustomed to customers who are hosting website with visitors in mainland China, they know what to do if your site gets blocked. While nowadays less likely, the blockage can occur to anyone especially on shared hosting plans where IPs are shared. However, simply contact Bluehost customer support and they will move your website to a new, fresh IP address. Unblocking your website when it gets blocked by the Great Firewall of China is as easy as that, you just need a hosting company that understands the procedure. And a tool you need is GreatFire Analyzer, for example with this link you can check accurate, historical data of blocks in China for the Bluehost.com domain. As you can see they have never been blocked since November of 2014 until April, 2019. Or as far back as the historical records go. Thanks for reading my review, hope you enjoyed it! Read more here if interested in hosting WordPress in China. Thanks for visiting, questions about Bluehost web hosting welcome! Also, I’m happy to share my knowledge on China related issues. Best regards & much thanks, David. Please, share the post in social media if you benefited from it. Last but not least, you might be interested in knowing about a possibility of affiliate links within this and other reviews, as well as other bits of content.